Whenever you see UN Ambassador Nikki Haley on video she's trying to start World War Three. 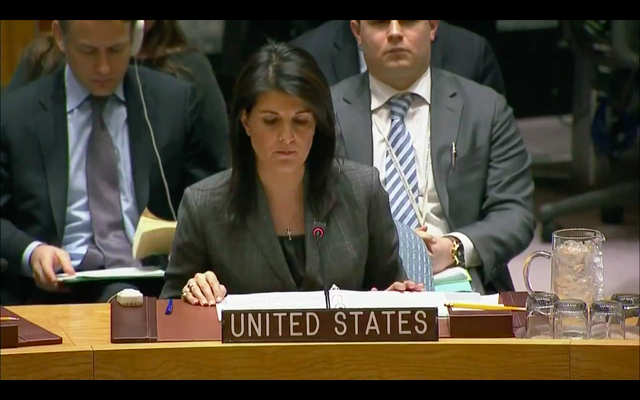 At today's UN Security Council Haley gave remarks about why the UN should "take action" against two of the US power establishment's favorite targets, Russia and the Syrian government, due to allegations that Bashar al-Assad has been using chemical weapons. That's right, just three weeks after the Trump administration unveiled its plan to keep thousands of US troops in Syria in order to force regime change, the tired old chemical weapons allegations have been unearthed and recirculated to trusting western mainstream media audiences. I am not a Syria expert by any stretch of the imagination. If you want detailed information about what's really going on in that nation I recommend getting in touch with real Syrians online and following the work of independent investigative journalists who regularly go there like Vanessa Beeley. Nevertheless, despite my lack of boots-on-the-ground expertise and intimate knowledge of every detail of what's going on in that country, I am absolutely certain that the western power establishment is lying very extensively about what is going on in Syria. One hundred percent certain, zero margin for error. I'd bet my life on it. How can I be so sure? I'll show you. There are many, many, many piles of evidence substantiating the fact that the Syrian government has become the target of what is surely one of the largest and most sophisticated propaganda campaigns in human history, but most people don't have time to comb through all the tiny details and sort through the complexities of what's what. For this reason I thought it would be useful to compile a short list for people who, like me, don't have time to dedicate themselves intimately to the in-depth study of Syria. This list makes it abundantly clear that there is an organized disinformation campaign saturating mainstream narratives about what is happening in Syria, making it therefore impossible to place any faith in the reports that are coming out about that nation's government today. All you need is a little information and critical thinking. Without further ado, here are five reasons why you can be as absolutely certain of the mass media's deception in this area as I am. I point to this one a lot. If you haven't yet figured out that mainstream media outlets are tools of outrageous war propaganda, and you watch this interview with your eyes wide open, your jaw will drop to the floor and you will never see the world the same again. After the highly suspicious and hotly disputed accusations of sarin gas use by the Syrian government in the Idlib province back in April of last year, a little girl was paraded before the CNN audience to condemn Assad and plead for western intervention. Anyone watching the interview can see that it is very obviously scripted, and the little girl is sounding out pre-written syllables in a way that children simply do not speak, using words and concepts that no seven year-old could possibly understand. This is self-evident to anyone who doesn't have a vested interest in not seeing it. Additionally, other video footage from around the same time showed that the girl did not speak English enough to even understand basic questions about what kind of food she likes to eat, instead regurgitating the pre-scripted line "Save the children of Syria" in response. More disturbingly, because this interview was scripted, it means that CNN's Alisyn Camerota necessarily had the other half of the script the girl was reading from. A prominent newscaster from a top US mainstream media outlet knowingly participated in a fake, scripted interview designed to manufacture support for western military interventionism, and sold it to CNN's audience as a real interview. The footage from that fake interview was then re-used by CNN to bully congressman Thomas Massie for his opposition to Syrian interventionism. Bana and her popular Twitter account have been propped up by countless establishment backers ranging from Time Magazine to Harry Potter author JK Rowling, as well as a lucrative book deal with Simon & Schuster. Her legitimacy has also been ferociously defended by Bellingcat, a neocon propaganda outlet with ties to the Atlantic Council, the same think tank whose Ukraine-tied influence has fingerprints all over the establishment Russia narrative. Bellingcat and its sleazy staff have been loudly sounding the alarm about the new "chemical weapons" story throughout online media. Similar to item number one, independent researcher Robert Stuart has shown conclusively how the world's oldest and largest broadcasting organization, the BBC, aired a documentary containing footage meant to implicate the Assad government that anyone looking can recognize as clearly fake. In a presentation for Media on Trial, Stuart breaks down part of the BBC documentary Saving Syria's Children showing clear and undeniable evidence that the footage which purports to show victims of an Assad napalm bombing has been staged and faked from top to bottom. The presentation is packed with information and the the 19-minute clip is definitely worth watching in its entirety, but for me the real clincher comes at around the four-minute mark after Stuart explains what burn victims tend to look and behave like, and he simply turns the sound off on the video footage and replays it with the question "just ask yourself, is this real?" It isn't. Plainly it isn't. Watch it and see for yourself; it's as fake as the Bana Alabed interview. It can be hard to catch propagandists in the act in a clear and undeniable way, but these are two irrefutable examples of the top outlets in both the US and the UK airing blatantly deceitful disinformation to manufacture support for military interventionism. You can say that this doesn't mean every single thing western media reports has been deliberately and deceptively manufactured in the same way, and that's fair... but you also can't say there's any good reason to go believing them, either. If the propaganda effort is that pervasive that it's airing brazen military psyops at the very top echelons of western media, you simply cannot trust anything they say about Syria. The fact that a known compulsive liar could technically be telling the truth about something at any given moment is not a legitimate reason to place your trust in him. This one is a rabbit hole and a half, and I cannot possibly list all of the countless pieces of evidence here against the so-called "Syrian Civil Defense" aka the White Helmets, but let me try and sum it up. Whenever you hear about a new Assad atrocity, the original source of the report is this extremely shady organization with extensive ties to both terrorist groups and western warmongers. Here's a new article from the Washington Post, originally from Associated Press, advancing the narrative in the headline that "Syrian activists" are reporting a chlorine gas attack. Read the article, and guess who those "Syrian activists" turn out to be? White Helmets. You can spend days and days researching this one (and some people have devoted their lives to exactly that), but just to get at the basics of this high-level manipulation, here is a video showing footage and testimony connecting the White Helmets to violent extremist groups, and here is an article with an assortment of supporting articles detailing the organization's funding from the US, the UK and the EU as well as its ties to Al Qaeda. In this illuminating interview Vanessa Beeley even goes so far as to say that the White Helmets are literally just Al Qaeda members who put on white plastic headgear when they want to film propaganda to advance their agendas. Once dismissed as a baseless conspiracy theory, it is now a known and admitted fact that the US has been arming terrorist factions in Syria to advance its regime change agendas. Utilizing extremist groups is one of the many ways the US-centralized war machine has found to get around the resistance of the American people to participating in new wars with US boots on the ground; they enlist the help of violent terrorist factions to attain their bloodthirsty goals. This is a known fact. Is there any reason to resist the notion that they'd enlist those groups in fabricating psyops as well? Consortiumnews recently ran an essay by Rick Sterling titled "WMD Claims in Syria Raise Concerns over U.S. Escalation" discussing the US war machine's extensive history of using lies, propaganda and false flags to manufacture support for military interventionism. Sterling discusses the flimsy grounds for the basis of the current anti-Assad narrative being rammed down our throats today, and reminds us simply that we have been here before, beginning his essay with the words, "It’s the WMD story all over again." The Iraq invasion was less than fifteen years ago, and now we're being scaremongered about a brand new evil dictator in the same region, right next door to Iraq, who also happens to have a great love of acquiring and using WMDs. According to a new report by Reuters, citing anonymous officials as sources, there is now a risk of those weapons of mass destruction coming "to US shores". “It will spread if we don’t do something,” the official warns in the Reuters report. Come on, people. Think harder. We've done this exact dance before, and not even that long ago. They lied to you then, and they are lying to you now. If the Iraq invasion didn't permanently shatter your trust in this schtick, it should have. But it's not too late to fix that. Look at this thing critically and stop swallowing their swill. 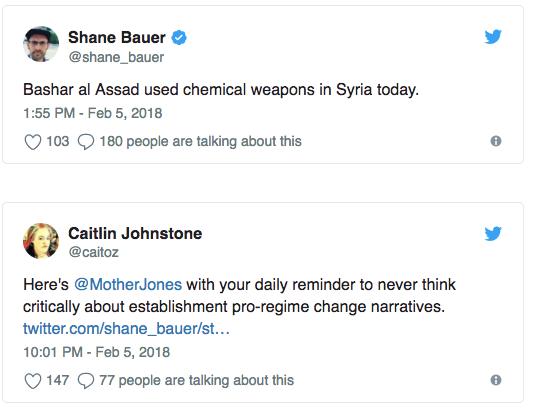 The propagandists focus on chemical weapons because there's nothing else they could accuse the Assad government of doing that the US war machine doesn't do constantly. They can't accuse him of merely killing civilians with bombs, for example, because the US does that every day. If Nikki Haley tried telling the UN that there was simply too high a civilian death toll in Syria and Russia's bombing campaigns, the rest of the world would just say "Oh really? America doesn't like civilians dying in air strikes anymore? Because we've all been meaning to talk to you about that..."
As noted by Max Abrams, "Assad has strong incentives not to use chemical weapons again whereas regime change supporters have every incentive to say he did." The leverage he'd be giving people like Nikki Haley to draw the wrath of the world down upon his head by committing internationally reviled war crimes would make it nonsensical for him to use an inefficient weapon like chlorine gas. It would be strategically disastrous, it wouldn't profit him any, bombs work much better, and his consistent denial of using those weapons (both inside Syria and outside) would invalidate any small advantage he might get from sending a scary message to his enemies. Add to this the fact that some places these weapons are alleged to have been used are not only packed with his own civilians but his own soldiers as well, and you're looking at a completely absurd story. 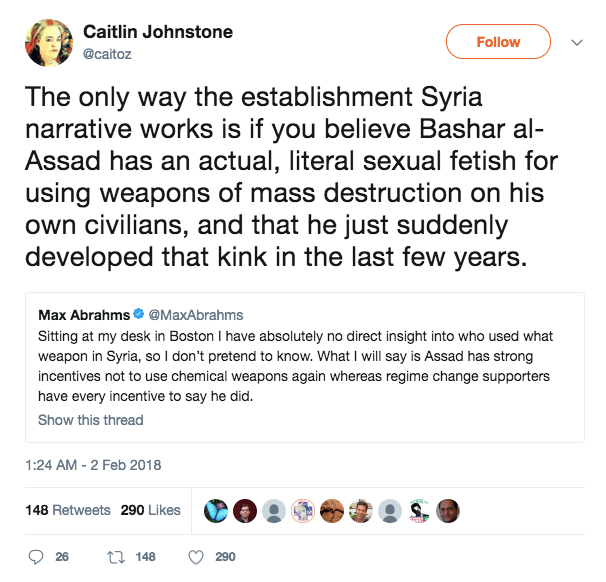 If you really think about it, the only way to believe the establishment Syria narrative is to believe that Bashar al-Assad has an actual, literal sexual fetish for committing war crimes on his own people. Not only that, but you have to believe he only developed this bizarre, previously unknown sexual kink in the last few years. That's the only way this notion that he's been gassing his own civilians willy nilly can possibly make any sense at all. Which is more likely? That, or the same establishment that lied to you about Iraq lying to you about Iraq's next-door neighbor? Believing the establishment Syria narrative is indefensible. Spread the word. The establishments game plan has always been, and always will be, to throw as many turds as possible at a wall, and eventually one of them will stick. Here are 2 disgusting pieces of propaganda by the guardian, which shows the depth of their own BS. These articles are so absurd on every level. And the guardian, who will instantly call any online independent media 'conspiracy theorists' used his youtube channel as citizen journalist evidence. Thanks a lot for writing this. There are lots of folks, including me, who aren't that good a critical thinking. We need someone like you, who is good at critical thinking, to show us how we're being manipulated. Heck: even patriots need your services. Now that America is by far the strongest nation, foreign lobbyists have a lot of incentive to manipulate America into fighting their own wars for them. Thank you for sharing, Caitlin. Even though our voices get drowned out by the system, every voice that speaks up for the rights of the Syrian people is meaningful to them. My heart has shattered a thousand times over this. I know so many of ours have. Excellent post Caitlin. I'll be sharing this at the White helmets Exposed Twitter page tonight. Here is 100% video proof that the White Helmets are terrorists. For those unaware, prepare to be fully red pilled. You have to admire the effectiveness of MSM propaganda. The person who invented the concept of "The Big Lie" would be very proud. You can get a lot of people to believe just about anything if you make the lie big enough and repeat it loud enough and long enough. Actual facts have no bearing on this equation. People repeat talking points with the firm belief that they are true without ever having taken the time to find out if they are actually true. Gullibility is a common human trait. Or as the old P.T. Barnum saying goes, there's a sucker born every minute. Great job Caitlin : Dispelling the mainstream narrative without drowning readers in all kind of facts/groups/geographical names that blurs understanding and confuses readers. Of course these facts are important, but to counter gaslighting about what is going on in Syria your approach is very helpful and necessary. Wow, The involvement of the NGOs and MSM in selling war is amazing. The stories of the staged events to garner support for regime change in Syria keeps webbing out! Thanks for providing all the information. I created a thread on Twitter laying out all the links you put in your article! The most telling should be what she says she really doesn't know what's going on in Syria, maybe a lot of other places in the ME either, if she ever sat down and tried to figure it all out she wouldn't even have time to write articles. We all assume what this is all about but quite frankly I am not convinced anyone can ever figure it out outside of religion being at the core of it all. Maybe we are fighting hatred, maybe it's just one side protecting another side otherwise the atrocities would equal genocide every day over there. To give people a better prospective at what you aren't looking at versus what you are here is a small sample of a reply I made on another blog site and just take a few minutes to think about it all and how it may add up into something underneath that we've never been exposed to and how it may add into the picture. In this one article all these groups have been described as being involved. This is just one small area of the middle east on a whole, if you take and were to multiply the number above by the number of each area in a conflict you would get a much better perspective on why nothing in the middle east ever gets solved. When I was moderator on a site heavily posting middle east stuff I sincerely sat down and tried to figure out who was who, who was fighting who and why they were fighting. I am honestly telling you it can't be done, you'll end up severely depressed before that ever happens. You would be much better off throwing your hands up in the air and telling them all to carry on because it just isn't humanely possible to figure our how to make all these factions come together and resolve all the differences, it simply can't be done. Well I can't be ABSOLUTELY certain. But I can be SKEPTICAL - because that is HEALTHY (and necessary). And I can be fairly CONFIDENT that is highly likely. And absolutely certain they have given me NO reason to think anything but that. And MANY reasons to base that upon. Thank you so much for this Caitlin. It is so helpful to have a clear and concise explanation, with proof, to show to all the doubters in my life. Keep up the great work. I'm so happy that you are here on steemit! Good job Caitlin. It is just agonizing to look around and see how easy it is to manipulate the American public. But perhaps the most irritating facet of our collective ignorance is how the left marches fastidiously for the establishment oligarchy while sniffing haughtily about the alleged stupidity of deplorables. We have a lazy populace that eats up the media's narratives. When we attempt to 'woke' them, we're insulted and subjected to propellerhead ridicule. I can't believe they think we're stupid enough to fall for this again.... I really can' t believe how afraid I am that they're right. Thanks for this great post. People nowadays are more thorough about kardashian than what really happens in the world today. Hope this post would help enlighten more people. Thank you for writing this important article! I've seen a lot of the videos you linked to, but the way you've outlined them all is really compelling. I agree, taking all of this evidence into account, I can be 100% CERTAIN that the US media is LYING about Syria. That first sentence perfectly describes her dirty job in the the UNSC, @caitlinjohnstone. Follow you.